In the food industry many compressors are used for the cooling and freezing of products. Especially the rotary screw compressor is much used for this application. 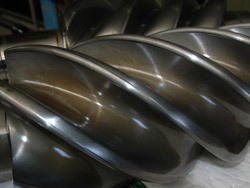 The operating lifetime between an overhaul is usually specified by the manufacturer in operating hours. However, with a constant use and a proactive maintenance- and condition monitoring program in which problems like lubrication, misalignment or other malfunctions are addressed immediately, it is possible to lengthen the operating lifetime up to more than four times. An overhaul of a rotary screw compressor is a costly matter and can, with all costs accounted easily add up to tens of thousands of euro’s. 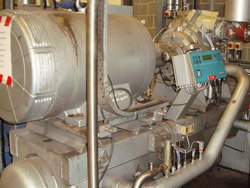 For one of our customers in the food industry we monitor the condition of 13 screw compressors for over 10 years. The results of the vibration measurements and analysis are used as a guideline for the maintenance and overhauls of these 13 compressors. This means that a compressor is only overhauled when a deteriorating condition actually requires this overhaul discarding the classing concept of overhauling based on operating hours. Vibration measurements show a constant condition of all 13 compressors for more than 10 years now. The theoretical service lifetime of the compressors has bin overstayed more than 3 times already. This all has resulted in disbelieve at as well the manufacturer as the maintenance contractor. The maintenance contractor offered a complete overhaul free of charge in order to prove that the maintenance interval was not based on commercial motives. During the dissembling however it showed, to everyone's surprise, that the inner parts still were as good as new. An bearing damage analysis performed by an independent bureau also drew the same conclusion. Periodically performed vibration measurements do monitor the machine condition and give an advance warning for deteriorating conditions. Besides the monitoring we also pay, together with the customer, attention to minimizing problems as imbalance and misalignment. By also optimizing the lubrication intervals with the right amount and type of lubricant it is possible for these machines to operate for many years without any problems. When anything wears out than the vibration measurements will show exactly which part is worn out. Short dedicated repairs can solve the problem preventing large overhauls in which many, often still perfect parts, are scrapped.